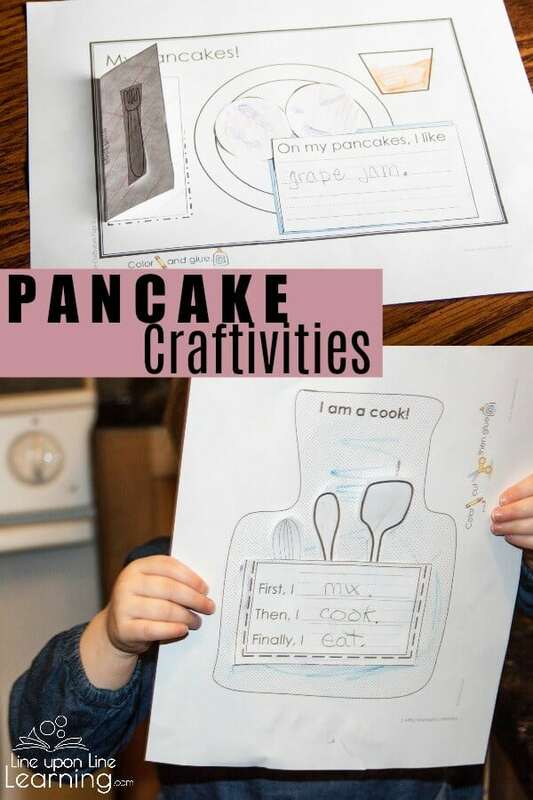 One of the favorite things my kids love to cook is pancakes, of course! 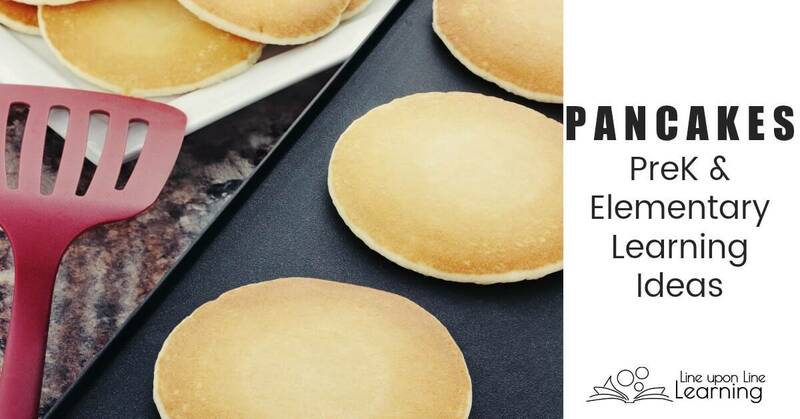 I believe it was one of the first things I actively encouraged my kids to take part of in the kitchen, simply because it’s fun to help stir, it’s exciting to watch the pancakes sizzle and flip, and it’s delicious to pile the toppings on. There are many ways to learn with pancakes. 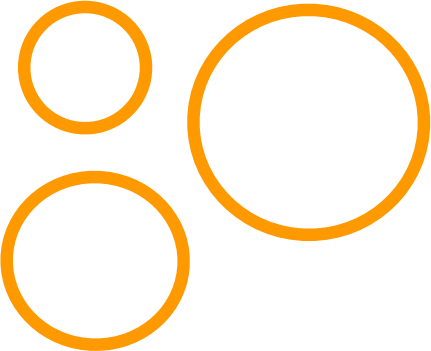 Here are some of the great activities we’ve done in the past years. Cooking pancakes is a fun extension of our school day. Here’s what we learn by making pancakes. Counting pancakes, adding/subtracting, or dividing pancakes among people. 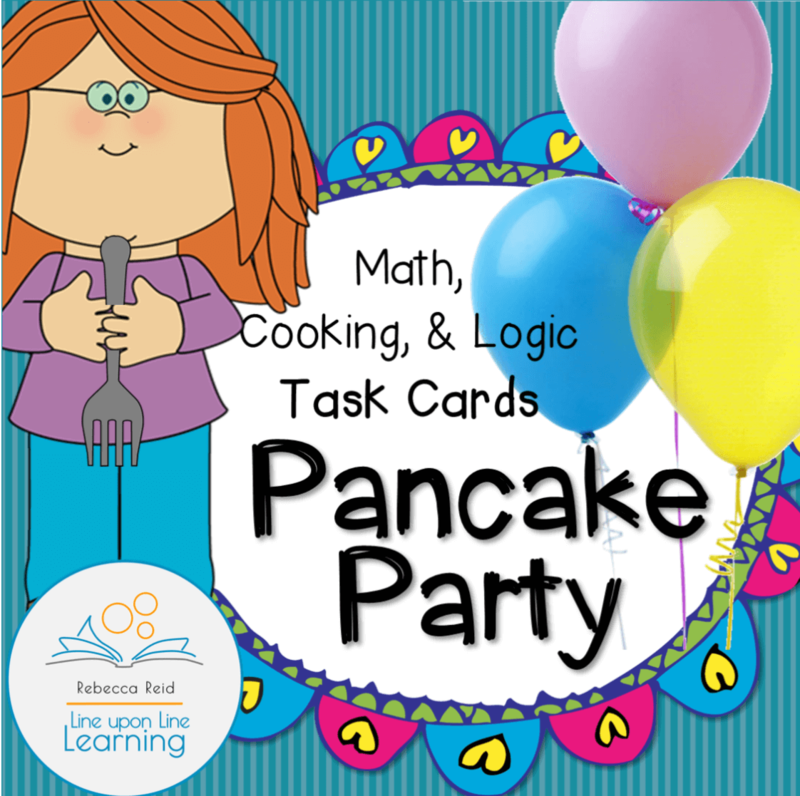 We also decided to make pretend pancake party task cards to practice these concepts. In addition to those items above, here’s what our pretend party adds. 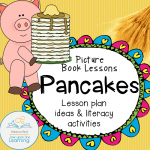 I’ve made these activities in a pancake activity pack (18 pages in color or b/w) as well as in pancake task card format (42 task cards). They are sold together! You could simple omit the cards you don’t want to include if you go with the task cards, or omit the pages from the packet if you do not want your child to practice the concepts. Either way, figuring out these pancake problems are a lot of fun. 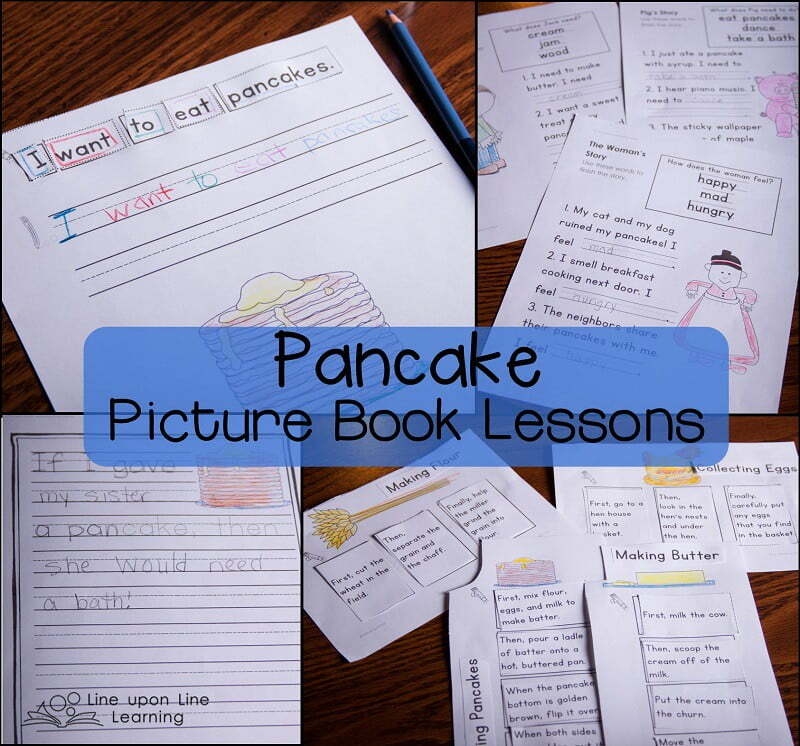 For my kindergartner, it was a lot of fun to read pancakes books as well as cooking and eating pancakes. The pancake picture book lesson plan for kindergarten and first grade. It lists three popular books (as well as alternates) about pancakes, including Eric Carle’s Pancakes, Pancakes! 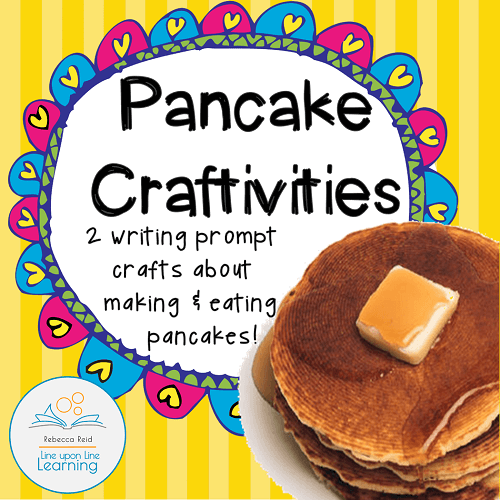 Included along with the lesson plan ideas to coordinate with the stories are some simple worksheets: cut, glue, and write sentences; retell the story by filling in the blank; how-to sequencing; and a creative writing prompt (If I gave ___ a pancake, then ____). 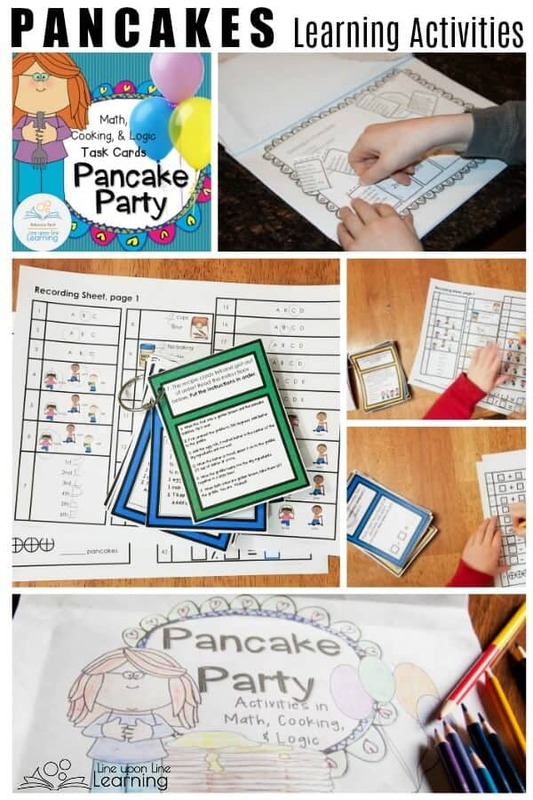 Cut-up sentences, sequencing, and story summaries make pancakes picture books even more fun. It is a lot of fun to cut-and-paste sentences! 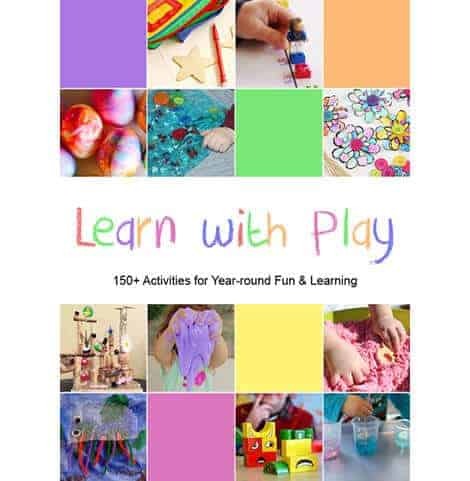 Some of the best learning for the youngest learners comes from imagination play. 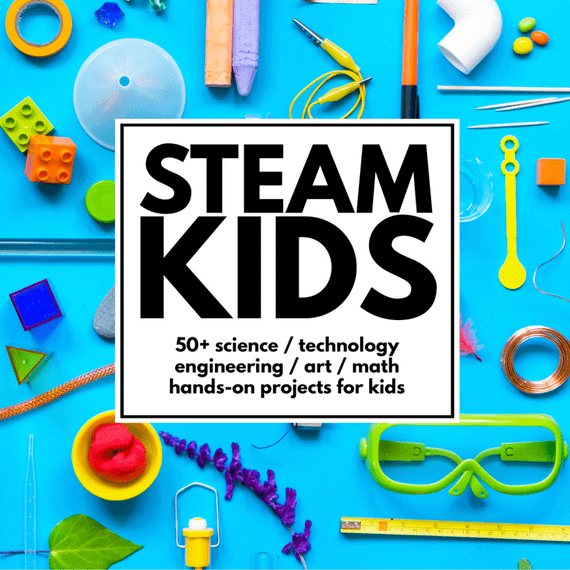 This includes pretend play as kids mix, cook, and eat pretend pancakes! 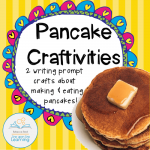 My set of pancake craftivities takes imagination play and makes it into a simple writing prompt craft. It is just right for a preschooler with a little help, or my kindergartner. She was very excited to “mix, mix, mix” with her paper spoon and hold her paper apron! These have simple writing prompts combined with a coloring, cutting, and pasting. I provided different writing templates so teachers can differentiate. 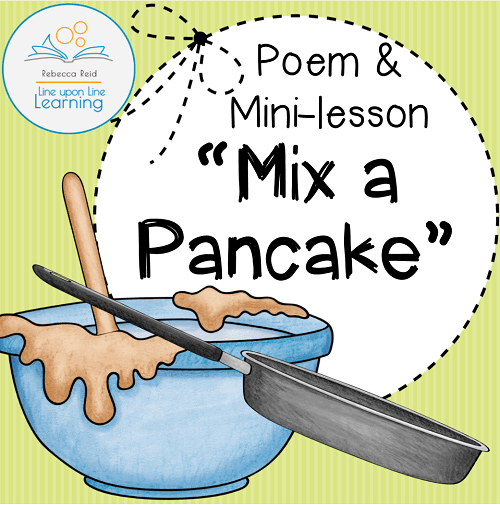 I also have a free pancake poem mini-lesson, with simple ideas for using it for class discussion. Some people hesitate to consider poetry in their classroom or homeschool, but I think poetry is the best item for creating on-the-fly mini-lessons. 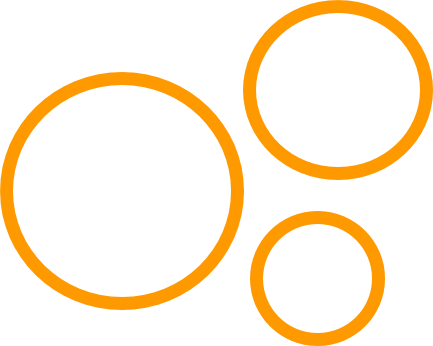 This free product may help you get some ideas as to how you can do that! 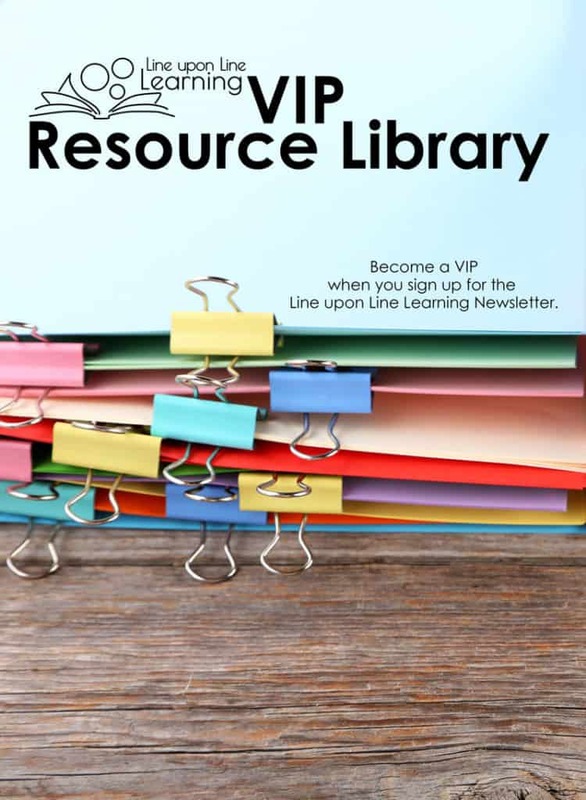 You can get the “Mix a Pancake” Poem and Mini-lesson for free when you sign up to become a Line upon Line Learning VIP. Or, consider some other easy kids recipes! How can you make those into learning moments?